So, I've been wanting to try the Baby Boom Challenge, especially in Sims 3, since I've been reading some other Sims 3 stories, and I just HAVE to play Sims 3, now, so why not a Baby Boom challenge? But y'all know me. I can't do JUST a challenge. I have to make it complicated. Also, I'm trying out a new format. This is the first time I have posted word-style documents to SlideShare, and I have to transfer them from Open Office into Word format, which messes up the formatting, so please excuse the page breaks. I have no idea how to fix that, and I'll likely never figure it out. But you can see the pictures! Huzzah! Prologue - October 1, 2018 - Note: I swear, that last page wasn't there on my Open Office version. I don't know how it wound up copied in twice in the Word .doc version. But it's gonna stay like that. Sorry. And while I'm waiting for Origin to repair the game, have two more chapters, because I played during the night, posted in the morning, slept all day, and then got up and did some more stuff, because I'm otherwise kind of useless. Chapter 19 - March 3, 2019 Yes, I spent two days straight playing this game, after finally getting my computer back after months without sims. Last edited by MichelleCYoung on March 3rd, 2019, 8:52 pm, edited 8 times in total. Ooh! Doing your own twist on a baby boom, I can't wait! Matt and Fiona are going to be put to the test! Bring it on! Heeey! You and itsjulie were the ones who really inspired me to do this, you know. So glad you are reading it. Well, I'm off to play these two. I hope they manage to survive the first night on the home lot. Midnight to dawn - no building, and no leaving home. Heheheheheee. I've already gotten quite a laugh from the prologue! I can't wait to see how these two handle parenthood! They'll certainly be better than their own parents, as that won't take much! And Chapter 1 is posted! I'm writing these up as Fiona's personal blog posts. It will be interesting to see how HER writing style develops (or devolves) as they go along. Yeah, Livvie, they don't exactly have a high bar to hurdle over, do they? And Chapter 2 is up! These are going much faster than my normal style, but then, they are also much shorter than my normal style, and the style is much different, and yeah. And Chapter 5 is now up! I guess I'm a little bit obsessed. Damn right, Fiona! Adoption is the best DaVinci would be lucky to have you! Ah! Eternal Winter!? What kind of spell-casting mothers would waste their magic on that! Misery! I love all the extra things you're doing for this! It sounds like so much fun! Hehe, well I mean if you're eccentric cause you like to be fashionable then work-it girl! Haha, I love how you worked in the bug with poor Fiona in that fountain! Damn mothers! Ooh and we're off to France, love it! Poor girl, flights are rough! HAHA! An epic game of tag! How perfect! Paybuddy support is on the way, my friends! As soon as I figure out how to use it Also while I'm totally down for your 12/12 mashup, I feel bad for you Fiona, cause that doubles your time spent pregnant! Hahaha I love her bunny outfit pajamas! Oh no, how dare they charge you for the drinks! What do you mean alcohol costs money?! Man you guys are making such progress on lifting this curse! I love the paybuddy button in the corner! How cute is that! Unfortunately I'd like to report it broken, as I can't seem to get it working! Sorry Fiona and Matt, you'll have to keep holding out! How did you manage to get snow in Champs Les Sims? I never got weather working in any of my vacation destinations! Man Fiona is a go-getter! I love her! Matt and she go so well together! Oh no, was that a need to start over? Hopefully Fiona stays fixed this go around! I love this so much! My fingers are crossed, I can't wait to see future Fiona and Matt babies! What kind of mother? Their mothers are hardly "normal" mothers, so, I guess I'd say "THAT kind." I love Fiona's fashion sense. Sure, it's eccentric to wear a mermaid outfit, just as it's eccentric to wear an ice cream outfit, but it's *more* eccentric to wear BOTH! This girl - the colors match, but never the style. Yeah, the fountain. First, I was groaning, with "A glitch, already?!" and then, I thought, "well, of course they're glitched. They're cursed!" I love France in this game. In real life, I only ever went to Paris during a garbage-workers strike, and it STANK, so... Not so much. I'm sure it's lovely in the spring, when it's clean. But, Ah! That countryside! Well, I've always been more of a country girl, at heart. Yeah, she is smart. She may not be charismatic, but she knows how to make friends and be popular. 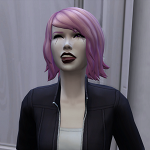 Childishness is one of my favorite traits in Sims 3, just for that. Yeah, she's going to be pregnant a lot. Especially because she is NOT supposed to use potions or lifetime rewards to get higher odds of twins and triplets. Then again, she's Childish, so guess what her favorite music is? I wish I could figure out how to get PayBuddy working. But fortunately, Fiona is a Computer Whiz, so she'll work that out, no problem. I ADORE those pajamas! And the fact that her only options for footwear were barefoot, plain slippers or cat/puppy slippers just had me howling. Like, "EAxis, you put a bunny in the game, but NO BUNNY SLIPPERS?! Then again, why wouldn't she choose cat slippers. She's a werewolf. She can walk all over cats. Wouldn't want to put her feet up a dog's patootie. That would be disrespectful of her genus. The charge for the drinks genuinely surprised me. I had never noticed before, since I don't really have sims drinking nectar very often, let alone sampling them at the nectary. But I was keeping a *really* close eye on the (<$125) account at the time, and was like, "Whoooooaaaaa! How are they in double-digits now?!" Some of those fancy drinks were VERY pricey, too, so I can so chuffed when he could swipe them, and drink them for free from his inventory. From the serving tray, you had to pay. Those two idiots just floored me. Mind you, there was deep enough snow for snowballs, but nope. Water balloons. Sims can be so stupid. Love 'em! Yaaay! Progress! It really was going so well. I was happy. Thanks for the offer of your support. It means so much! Fortunately, Matt's boss gave a significant donation. Truthfully, I have no idea which mod did the weather on travel. I had not seen it before in my game, either. However, I was rather glad of it. Fiona really is a go-getter. She is smart and ambitious, in her own way, and knows how to use her and Matt's strengths together, and how to strategize to maximize their resources. And she really appreciate's Matt for his more mature views on the world, and his superior knowledge of people - how they tick and how to get along well with them. They are really a "power couple," in my head. Not that they are, or will be, "powerful" or celebrities, but just the way they work together, viewing each other as equals, with strengths and weaknesses that complement each other, bringing out the best in each other, and helping to smooth each other's rough patches. They've been best friends practically forever, and know all of each other's flaws, and love each other, anyway. Not loving despite the flaws, but loving, flaws and all. Thanks! I had fun with that curse. I also wrote a version, that was much more expensive, that was the "Perfectly Private" curse, where 1) you didn't KNOW you were cursed, and 2) you didn't know who cursed you, and 3) you didn't know how to lift the curse! All of the information *could* be discovered, of course, but you'd really have to work at it. Mostly, you'd just be *really* confused about what happened to the world, in general, and specifically in your neighborhood. But the mothers certainly were not going to spend their new car money just on that option, especially if it would keep them from having the option of ripping their kids a new one. The MM curse was both cheaper and allowed them to get the last word. That was a need to start over. And I think when they travel again, weather will be "normal," because I took out almost all the mods. I kept the NRAAS mods, and "Sapient Sculpting," because that one allows sculptors to learn how to make low-level sculptures, even when they are higher-level sculptors, because it makes NO sense at all to say, "You are far too good a sculptor to ever be able to figure out how to sculpt a level 1 sculpture! Boo you, for learning too fast! Sapient Sculpting keeps the minimum level to learn a sculpture, but moves the *maximum* level at which you can discover a sculpture up to 10, which is realistic. I am going to miss the "fishable pools" mod, though. I rather liked the idea of well-stocked swimming pools, with windows in their sides, so your sims could have a basement seafood restaurant, where you can actually SEE the food. Actually, I considered carrying on, with the mods removed, but then I thought, "They've had it far too easy. It's hardly a curse, at all!" Note to self: If I ever again have a "must live on a non-furnished lot from midnight to dawn, in the winter" game, Be sure to take a MUCH longer nap before curfew. Cold, they could deal with, if they just kept moving, right? But exhaustion was scary. Matt was minutes away from passing out. Also, I'd probably have them get that first athletic point during the day, so that they could at least jog around in circles to keep warm until dawn. Still, I must say, I LOVE the fire station! Sure, it could have better furniture, but it has quite enough to get by. If you're playing a lawn-living legacy, make your founder a fire-fighter and let them live at the fire house for the first week or two. It's more efficient (no time wasted in a car-pool), and they have all their needs, plus more opportunity to befriend their co-workers and skill up for the profession, while making sure that the alarm and fire truck are NEVER below 90% maintenance. Weirdly, mine started at 30%, then dropped down to 0% as soon as the alarm went off. He worked on them for a while, and then the alarm went off (It was at around 50%, by then, from him working on it), and again, the alarm and fire truck dropped to 0%. And at 0%, you can't even GO to the emergency! I'm so glad you're enjoying this! It really is a fun one to play, I'll tell you that! The second tag game made 38 acquaintances, and 8 friends. It would have been more, except a busker distracted the whole lot of them, and put an early end to the tag game. Still, he has enough for the first half of the skill, and gets a hefty boost on starting new relationships, as well. Fiona had to stop playing the game, because there was so much to collect at that park. Over $2000 in wildflowers, as well as three plants to harvest. I've never done the elixir store flip before. I'd heard of others doing it, and decided to try it. Really pretty awesome! If I didn't find so much stuff I wanted to KEEP, it would even be truly profitable. But I like to actually use the elixirs. So, my PC is broken, and I don't know how long it will be until it gets fixed. For now, I'm stuck with just my Mac, and I won't be able to play or update this for a while. Oh no! I'm so sorry to hear! Well that's alright, I'll just have to wait patiently until it's fixed! Hope your computer gets patched up soon! I have my PC back, and can play again, at last! I think I'll play a bit, and have some fun, before writing and posting. I've missed it sooooo much! Still, I should have something (maybe several chapters? Depends on how long I play, I guess) ready for posting by the end of this week. Huzzah! Yay, you're back! Hopefully you are having fun playing again. I am! I played for two days straight. Now I have a lot of stuff to write up. A few fun things, and a few things where I missed the picture, because they took me by surprise and happened too fast for me, and so you just get to miss out on it. But yeah, a lot of stuff. Also, I need to remember how to post stuff. Ummmm, I need to upload it somewhere. Dang. I'll get it updated before midnight today, I promise! If not today, then tomorrow. I did it! Chapters 6 through 19 are now posted. Yeah, that's a lot for one update, but after months without my computer, I super-binged on Sims 3. So, enjoy! Michelle! I'm so, so glad you're back!!! And you've given me lots of new reading material! Does this mean your computer problems have ceased? If so, yay!! My old computer problems have ceased. Yaay! I haven't opened Youngdale to see if it works better. I probably have to still finish moving it over to New Youngdale, and SimPE and I are not simpatico, so that takes time. But, yes, I'm back in the saddle! Hooray! Yeah, there's a lot there. And I've already started chapter 20. Two solid days, including one night of simply forgetting to sleep... I have missed the Sims!